12/24hr Clock, Countdown, 20 hour stopwatch at 1/100 th sec, Pacer, Alarm etc. Long life, replaceable Lithium battery, Water resistant case with neck lanyard, 4 button operation.Simple to use. Similar to the original Seiko watch. 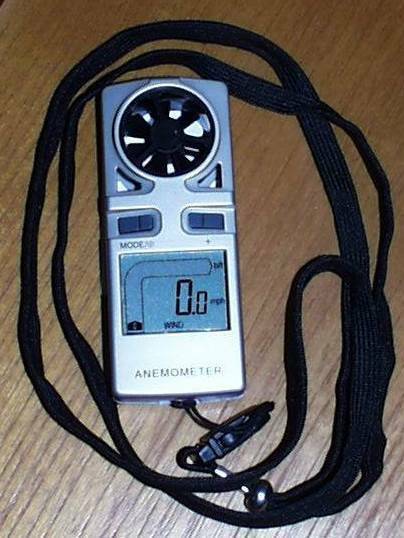 Compact Hand held Wind Meters, with or without temperature and windchill measure. Essential for windswept lakes etc.! Could save you a wasted or dangerous outing or help you decide on any gearing changes etc. LCD Shows wind speed in 4 selectable units, with average, maximum and current values plus Beaufort scale indicator. Accuracy +/- 5%. Normal temperature and windchill temperatures available. Backlight fitted, Neck band for easy carrying and use, very light, water resistant, 39x17x98mm. easy change battery up to 1yr life.